As a mom, I’m always concerned about how my son is handling the challenges of life. So when we moved to a new state, I wanted to minimize the emotional roller coaster that often accompanies a big life transition as much as possible. With that move came a number of changes for him: new school, new friends, new daily routine, and a new house. Major changes like this may disrupt a teenager’s life more than parents realize, so we owe it to them to make it as easy as possible. While his behavior had not changed significantly due to the move, we did want to provide him with a structured environment where he could adapt and adjust to all the new changes in his life, and karate just fit into that naturally. 1. Teenagers, especially boys, need more physical activity than parents can reasonably provide on a daily basis. Our culture has become highly saturated with television and video games, which is led to things like childhood obesity, withdrawing from structured play and team sports, and lack of physical activity. For far less than it would cost to buy the new videogame of the month, we decided to sign him up to karate class. This allowed him to be in a setting surrounded by others around his age, doing something that was fun and physically challenging. 2. Discipline, learning a new skill, and receiving rewards for a job well done all fit into our style of parenting. On one hand we are wary of involving our son in every possible activity available, it almost neurotic attempt to climb some imaginary social pecking order based on how many courses and classes one takes. However, we felt that it was important for him to try something new that was outside of his current skill set (and ours! ), So for a very reasonable fee, karate classes helped us to tick all of those boxes. He beamed when he earned his first new belt, which let us know that we were doing something right. 3. Self-defense is a necessity in today’s school environment. Nobody likes to hear about all of the bullying and harassment goes on within even the best school systems, but like it or not, it happens. We are fortunate that our son has never had to experience anything like this, but it is always better to be prepared so that if she does have to defend himself, he can. 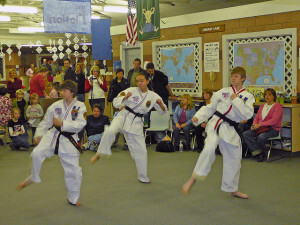 The vast majority of martial arts and karate schools, like the one run by our friend, Larry Batista in Bethpage, NY, emphasize the need to use restraint, wisdom, and maturity when facing a potentially dangerous situation. That said, the best karate schools will teach students how to genuinely defend themselves, regardless of their age or size. One last point that bears mentioning is that martial arts training helped our son to learn how to use his voice authoritatively, stand confidently, improve his fitness and treat others with respect. Our feelings parents is that it is one of the most beneficial outside activities for a teenager or adult, and that every parent should give their kid an opportunity to take karate classes if only to see whether they will enjoy it as much as our son. This guest post was written by Susan Eaton. She lives in NY with her husband and children. An aspiring portrait artist, she is a stay at home mom for her lovely children. She has been practicing Yoga for 8 years, and is working to become a proficient cook of both French and Cuban cuisine.